My husband and I are in a bit of a food rut. It’s not necessarily a bad thing, and in fact, it saves us time, money, and energy to eat the same lunch every day. Wait. We don’t eat the same lunch, we each get our own, but we’re eating exactly the same thing every weekday. You knew what I meant. We jumped on the SALAD IN A JAR bandwagon. It’s been a couple of months and we’re really loving it. He takes his to work every day, but I have mine here at home where I work. I’ve been posting about our journey on Facebook and someone commented that they didn’t understand why I would need to do this if I worked at home, perhaps picturing a woman with my name and hairstyle who wasn’t quite so lazy as me. But I am lazy, er, efficient and I have the misfortune of a history of gaining weight due to not eating enough. A ridiculous problem to have, but there it is. I tend to get very involved in my writing and the other work I need to do, so I forget to eat. Or I postpone it. This means I either grab something easy that I can eat at my desk, or I end up so ravenous that I storm through the kitchen like a competitive eater at the county fair. So, now, with my Salads in Jars, I mitigate my damage by setting an alarm to remind me to eat, and looking forward to it because it’s also the only time I allow myself to do my beloved crossword puzzles. And because it’s Real Food, it takes real time to eat, giving me ample guilt-free crossword time. 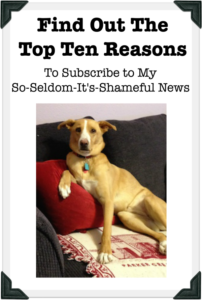 When we decided to do this, I sent out a call to my Facebook peeps and they gave me some basic info to begin with. • Wet ingredients on the bottom, dry on top. • Find a very long fork or a bowl to dump them into. Unless you enjoy getting salad dressing all over your fingers. This was excellent advice because I was all set to tip it back and slurp it down like a drink. • The plastic lids are a lot more convenient and dishwasher friendly. This might be good advice, but I had already bought the metal ones and we wash dishes by hand so it’s kind of a moot point. I was smart [read lucky] enough to buy the wide mouth jars because that definitely matters. Here’s what I’ve learned along the way. May 25 ”” Our journey begins. 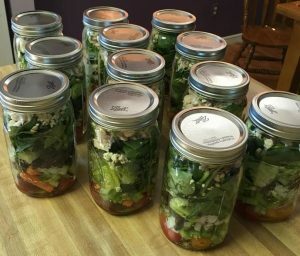 May 30 ”” Prepped our first dozen Salad-in-a-Jar lunches. Took 40 minutes with hubs doing all the chopping and me, you know, directing. Without the cost of the jars, these salads are $3.46. 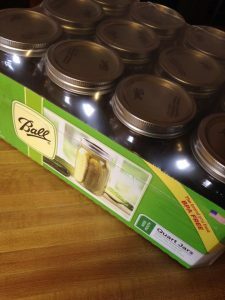 (I got a dozen wide mouth 32oz jars for $12.) Now we’ll just have to see if we like having salads every day and what the last couple ones look like. Right now, though, they’re purty! One thing I hadn’t thought about was whether we had enough room in the refrigerator for 12 quart jars. Luckily, we did. May 31 ”” Day One Salad-in-A-Jar. One smaaaaall problem. The olive oil had solidified in the refrigerator. (See it there on the tomatoes?) Turned out to be no big whoop. Five minutes or so while I filled a drink and got my crossword ready and it was fine. Gave it a stir and presto! Everything crisp and delish. 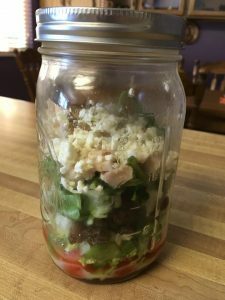 June 1 ”” Day 2 Salad in a Jar. Today I got it out of the fridge and shook it, to unsolidify the olive oil. Clearly, I’m stronger than I look. Despite my vigor, just bruised the lettuce a bit. All still crunchy and delicious. June 2 ”” Day 3 Salad In A Jar. Started eating before I remembered to take a picture. Still good, crunchy and delicious. Halfway through our stash. June 6 ”” Today is Day 7 of Salad in a Jar. Day 3 was Thursday and I didn’t have one Friday-Sunday. Happy to report everything is still crunchy, but a couple of the cucumbers that were sliced thin are a bit wilty. Except for them, all is delicious. June 8 ”” Blech. Ten days is too many for Salad in a Jar. But all in all, an excellent experiment. Here’s what we’ll do from now on. and even though it was perfectly fine to have the oil and vinegar in there, we don’t really need to, so we won’t. Hubs can keep a bottle of dressing in his fridge at work. It will make cleaning the jars easier, too. 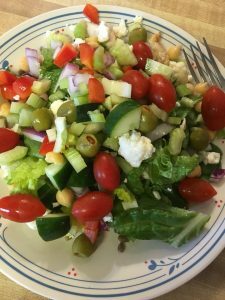 June 19 ”” Salad In A Jar experiment continues! This week we’re trying to quantify and simplify so we don’t have to think. No salad dressing, and no cucumber because we got a bitter one last time and it put us off. Here’s our new recipe. I’ve written it in the order it goes in the jar. That way hubs knows what to chop up first so I’m not standing around twiddling my thumbs. 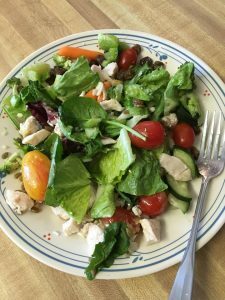 This time it took us less than an hour from leaving the house to grocery shop (for the salads PLUS our other food for the week) until the salads were in the refrigerator and the kitchen was clean. July 11 ”” I forgot we put black beans in our Salads in Jars this week and had a fleeting thought we added candy. Which is hilarious because black beans do not look like candy. Not any that I’d eat, anyway. Have you played with Salad In A Jar? Any other good tips? What do you put in yours? 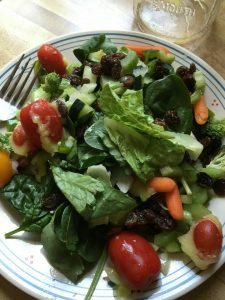 This entry was posted in Goofy Stuff, Stuff Worth Pondering and tagged eat more veggies, healthy eating, healthy lunch, Salad In A Jar on July 14, 2016 by Becky.